A white cut at a looks like a good possibility, but it's impossible for Black to patch up both weaknesses in one move ... or is it? 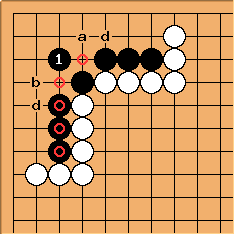 By playing , Black creates a trumpet connection, which protects both possible sites against a cut. The trumpet connection is also called the lion's mouth, and is related to the tiger shape, though the trumpet connection is much stronger. A drawback with this shape is that it still leaves a peep at a or b. In many situations, the solid connection (either of the circles) may be better. Also, a solid connection in one place would mean a White cut in the other place would be caught in a ladder. The peeps will also rob Black of eye potential, which may be relevant in other situations. 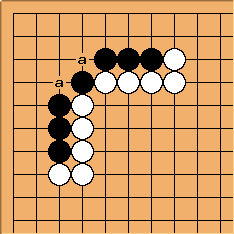 In the example on the left, I think it will be a real struggle for Black to stay alive. Dave Sigaty: In the case where there are three stones the peep will not work. Black has time to answer a peep by playing at d. If there are only two stones, Black must answer the peep by connecting. Similar shapes but a very different result. binky? Surely the reason for prefering a solid connection is the minimisation of opponent's ko threats.